As I exit a corner with my foot nailed to the floor and all the nannies switched off, I can’t help but mutter to myself, “So much grip.” The new 2019 Chevrolet Camaro Turbo 1LE oozes it. The car combines the 2.0-liter turbo-four engine and the wizardry of the famed 1LE Performance package, which is a thing of beauty, even with the least powerful engine option. The ZL1, SS, and V-6 have had their turn; now it’s time for the base engine to get the track treatment. Producing 275 hp and 295 lb-ft of torque, the Turbo 1LE isn’t a straight-line speed brute, though Chevrolet claims a pretty quick 5.4-second 0-60 run. Instead, it shines in the corners. During my time in our former long-term 2016 Camaro SS, power oversteer was a worry when pushing the V-8 version hard through corners. But this isn’t the case with the Turbo 1LE. I found myself eagerly applying full throttle exiting corners, not fearing the worst. If I’d driven the SS that way, the ditch on the side of the road would’ve been my next stop. You might miss the power of a larger engine on a straight stretch of road, but the coupe makes that up with impressive cornering control. Three sports cars with “low” power outputs and superior cornering capability come to mind: the Mazda Miata, Subaru BRZ, and Toyota 86. But the Camaro is quicker and more powerful than those three and has a lower starting price than their top trims. If you’re curious, the above SS hit 60 mph in 4.3 seconds and produces 455 hp from its 6.2-liter V-8. The $4,500 1LE package (available on all LT trims) gets you Camaro SS suspension components, including larger-diameter front and rear stabilizer bars, uniquely tuned dampers, stiffer rear cradle bushings, and upgraded rear toe links designed to improve lateral stiffness. The goodies continue with lightweight 20-inch forged aluminum wheels shod in Goodyear Eagle F1 Run Flat summer tires (245/40R20 front, 275/35R20 rear), a mechanical limited-slip differential, track cooling package (engine oil, differential, and transmission coolers), short-throw shifter, dual-mode exhaust system, an upgraded fuel system borrowed from the SS (for high-load cornering), and Touring, Sport, and Track drive modes. If that’s not enough, Competition mode enables launch control and displays performance instrument readouts and shift lights. Recaro seats, a suede-wrapped flat-bottom steering wheel, and a suede-covered gear shifter are extra. Outside, you won’t find “Turbo” or “1LE” badging. 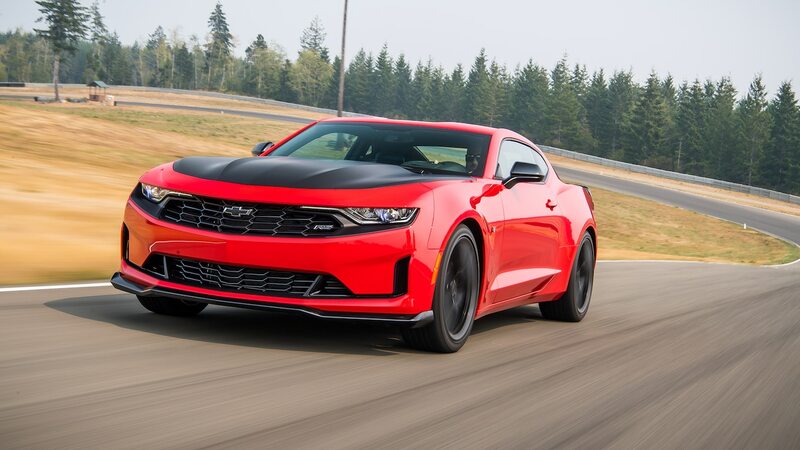 Instead, the hood, front splitter, and three-piece spoiler are wrapped in satin black, distinguishing the Turbo 1LE from other, less track-focused Camaros. To get us behind the wheel of the Camaro Turbo 1LE, Chevrolet invited us to drive a picturesque 60-mile route from our hotel in Renton, Washington, to Ridge Motorsports Park, where a 16-turn, 2.47-mile road course was waiting for us. On the way there, the 1LE provided good ride comfort, better than the Camaro SS. I expected an overly stiff ride given the performance suspension, but I was happily surprised. The throws from the Tremec six-speed manual (the only available transmission, and rightly so) are short and precise, which is a good thing because I found myself downshifting a gear or two whenever I passed on the freeway or simply to pick up some speed due to the transmission’s tall gears. Sixth gear should be used strictly for cruising, not for passing. But 30 mpg highway is nice (20 mpg city). Turbo lag doesn’t help the situation, and it’s noticeable since peak torque hits a little late at 3,000 rpm (and lasts until 4,500 rpm). Still, Chevrolet claims that 90 percent of torque is available below 2,000 rpm. Why not 100 percent? Many modern turbo engines hit max torque below 2,000 rpm. Plenty of road noise seeps into the cabin. If you don’t like it, about your only choice is to tack on the optional Bose audio system and crank it up. With the scenic drive over, it was time for the track. Before I set out, I inserted an SD card into the optional Performance Data Recorder slot for later viewing. On the track, it’s hard to find many faults with the coupe. Almost nonexistent body roll provides for crisp and confident turn-in, and the chassis is rock-solid. Over- and understeer almost never happened unless purposely induced, something that put a smile on my face the few times I did it. Steering felt similar to that of the SS, heavy but quite telepathic. The front four-piston Brembo calipers—borrowed from the SS—bite hard and help bring the sports car to a stop from 60 mph in a Chevrolet-claimed 112 feet, not bad for a car weighing at least 3,350 pounds. Braking power never seemed to fade and the Recaro seats offered plenty of lateral support and comfort during our numerous runs.